The Barbican Centre is a HUGE complex, including art galleries, cinemas, a theatre, a hall for music. It's the home of the London Symphony Orchestra & of the Royal Shakespeare Company. 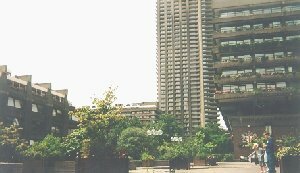 The Barbican Centre is owned, founded and managed by the Corporation of London, the local authority for the City of London. Near the Centre there are also flats, a large pool with fountains, a School for girls, and everything is full with plants and flowers. I loved it. 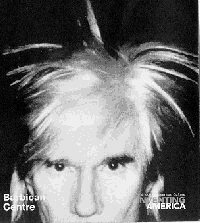 We visited the Barbican Art Gallery, and saw an exhibition about Andy Warhol, named: "The Warhol Look Glamour Style Fashion". A chameleon of changing style, Andy Warhol moved with exceptional fluidity and ease between differing art forms and cultures, including in his repertoire photography, film-making, performing as a model for hire, overseeing the publication of Interview Magazine, swinging at Studio 54 - the New York night club - and, of course, creating the screen prints for which he is most famous. This exhibition, drawn primarily from the Andy Warhol Museum's vast collection, encompasses screen prints, films, reconstructed window displays, photographs, illustrations and clothings and gives a fascinating insight into Warhol's life and work, and the New York scene of the period 1950-90. By examining the whole range of Warhol's work it emerges that his fascination with fashion, style and glamour was not a distraction from his 'real' work but an integral part of it and a complex and productive response to the relationship between art, popular culture and daily life. The exhibition is divided into areas, each representing a part in Warhol's life & art. The areas are:Window Display, Hollywood Glamour, The 1950s, Silver Factory Style - The 1960s, Phone Andy, Drag & Transformation, Interview, Uptown / Downtown. I quite enjoyed the exhibition and learned many new things about Warhol. After that we sat outside near the pool and ate our sandwitches. Hadas fed the doves. There are restaurants in the Centre also. We sat near the plants you can see in the picture.